As a result of everyone's hard work over the past year with all our eco activities, we have been awarded the 'green flag' which is the highest award for eco-friendly schools. Thank you all for your support with the past years events and we look forward to continuing the good work over the next year! Our green flag should arrive soon. The children on eco-team had an end of term treat to celebrate all their hard work. They were brilliant when the assessor visited and talked with great enthusiasm about what they had done. 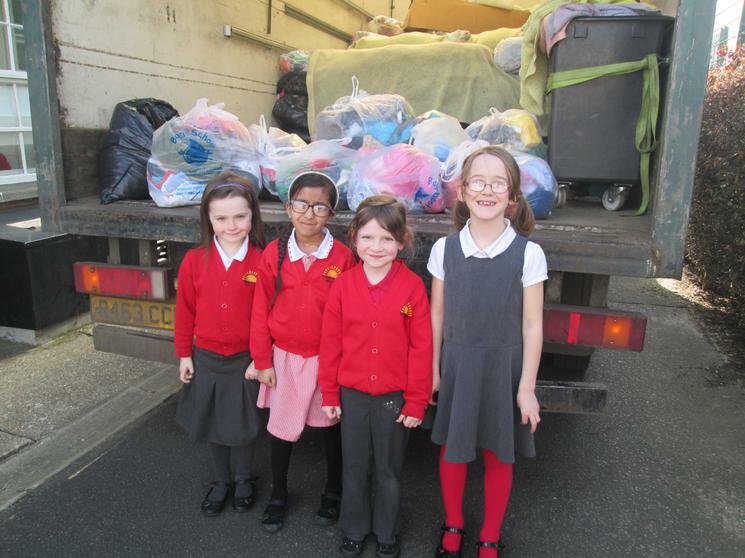 Thank you to everyone who donated clothes for recycling. 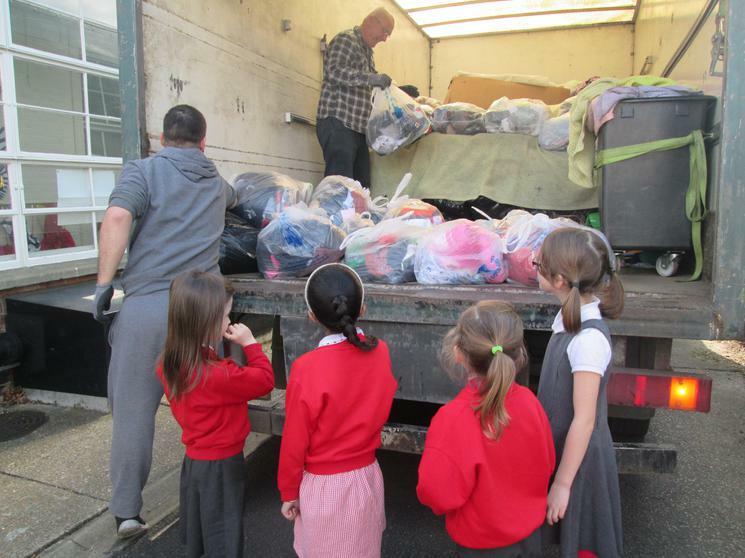 We had lots of bags which have now been taken away to be recycled and reused. Next week on Tuesday 15th March we will be sending home bags for you to help us to collect unwanted clothing and textiles. The bags will need to be returned to school on the morning of Tuesday 22nd March and can be left either just outside the main office, or in the shelter on the main playground. For every kilogram we collect we will receive a voucher to spend on new science equipment for the school. We would be very grateful for your support with this event, and will let you know how much we raised. Children from 2TV and 1JA reciving their Eco-class prize for the most children in a class who walked to school. Thank you all very much for supporting walk to school day last Wednesday. Your child has brought home a letter explaining the results of the day which you can also find attached here. You were all brilliant in supporting us on this day. 1JA and 2TV were the most eco-friendly classes on this day and were presented with their plant prizes in assembly yesterday. Please continue to walk to school as often as you can, it really does make the roads and car park around the school a much safer place as you can see from the car park photos. As the letter explains there are sign up sheets in the office if you are interested in joining or organising a walking bus. Also, the governors will be looking into purchasing bike and scooter racks and we will let you know as soon as possible about the outcome of this. We have got a very eco-friendly topic coming next half term called 'save the world' where we will be exploring recycling, renewable energy and plants. We will be asking you to support us in collecting unwanted clothing to recycle in return for tokens to be spent on science equipment in school, so please start saving these for us. Once again thank you for your continued support with our eco-events. We had an assembly this week to talk about 'walk to school day' which will take place next Wednesday 3rd February. The Eco-team have noticed when we did our environmental review, that the church car park is nearly always a very busy place with lots of cars and not many spaces. Please see the attached letter that is going home today and the powerpoint that was shared in assembly which explains that we are hoping to improve the situation and encourage more of you to walk, bike or use your scooter on the way to school instead of bringing the car. It is really important to us that the church car park area is a safe place for your children and we would appreciate your support with this. Attached to the letter coming home today is a questionnaire that we would encourage you to fill in and return to school as soon as possible. This will help us explore ways that we can help you to come to school in a fun and healthy way! Electricity savings results from 'switch off' fortnight. We have spent the past two weeks joining in with 'Switch Off Fortnight' as part of our efforts to help children understand the importance of saving energy. We have had all the lights and computers off this morning to show how much we rely on them and to see how much energy we could save. We are aiming for the Eco-Schools 'Green Flag' award this year and this month is energy month. To achieve the award we have to find out about energy and how to save it and identify other areas of the school that we can improve environmentally. Our action plan is below and on our Curriculum page here http://www.springfield-inf.suffolk.sch.uk/eco-schools/ so that you can see our plans for the year. See if you can save energy at home. Can you turn off unused lighting and electrical equipment? Can you survive a day without your laptop or Xbox?